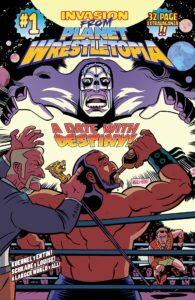 Pullbox Reviews: Invasion from Planet Wrestletopia – Whatcha gonna do, Brother!?! When a disgruntled professional wrestler declares himself “galactic champion of the universe” an alien planet of wrestlers sees it as an act of war! A whopping THIRTY-TWO page megaextravaganza of a comic book kicks off this series with art by Dan Schkade, colors by Marissa Louise and lettering by A Larger World Studios. Designed by Fred Chao. Created & Written by award-winning writers Matt Entin & Ed Kuehnel. 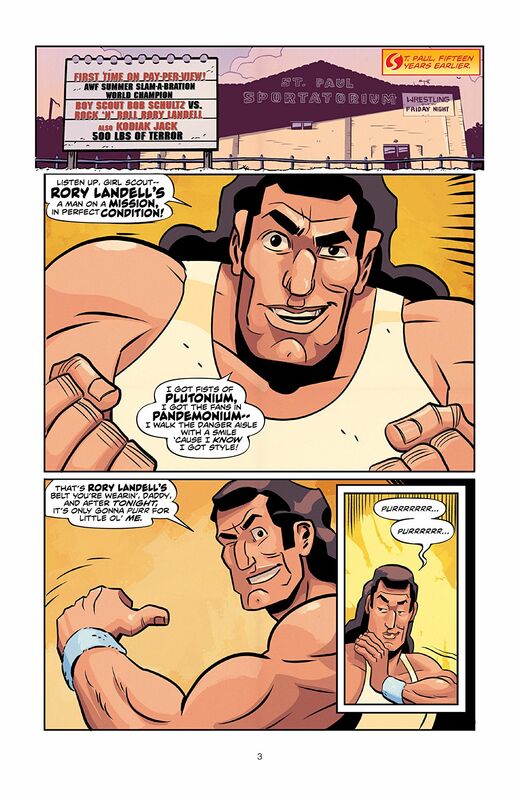 Once upon a time, Rock ‘n’ Roll Rory Landell was on top of the wrestling world and climbing fast. The problem with success is that if you try to take too much, too fast, the trip down can be pretty jarring. Rory finds this out after going against the instructions of the promoter for the American Wrestling Federation by declaring himself the undisputed Galactic Champion. From there, it’s been nothing but traveling from town to town, working the casino circuit just to stay in the game. What Rory doesn’t know is that an irate promoter is going to be the least of his worries. As it happens, his declaration of galactic superiority caught the attention of some folk with a little bit to say about Rory’s claims. Whatcha gonna do, brother, when an entire planet of high-flyin’, chair slamming, turnbuckle chewing wrestlers brings their thirty-two inch pythons down on you? I remember spending my Sunday mornings glued to the TV, watching the over the top antics of the American Wrestling Association… pre WWE, pre WWF. Yes, I’m that old. This was back when Jesse “The Body” Ventura was teamed up with “the Golden Boy” Adrian Adonis to form the “East/West Connection”. I watched a young upstart calling himself “The Hulkster” come on the scene, taking on two opponents at a time to kickstart his path to superstardom. I remember huddling in the living room with a bunch of friends for the very first Wrestlmania. I could go on, but I think I’ve established my credibility when it comes to the world of professional wrestling. Now, I’m going to use that credibility to wax all poetical on this entry into the totally different, but no less colorful, world of indie comics. I don’t think there can be any doubt at all that Invasion From Planet Wrestltopia is a labor of love. 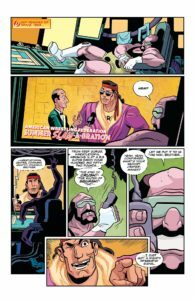 What writers Ed “the Carnage Artist” Kuehnel & “Masculin” Matt Entin have done is craft an ode to commemorate the majesty and mayhem associated with all who have ever stepped into “the squared circle”. From the first onscreen tirade of Rock ‘n’ Roll Rory, in whose voice I will forever hear echoes of the great “Macho Man” Randy Savage, to the eloquence of galactic gladiator “Manifest Destiny”, there’s no doubt that this creative team has spent many an hour glued to the tube as they watched the high flying action of professional wrestling. The tone they’ve set for their yarn is as perfect as dropping an opponent through a table and landing the fast three-count. 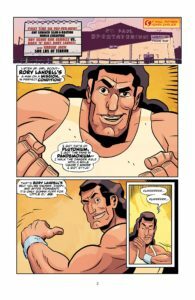 In short, Invasion From Planet Wrestletopia was a blast to read, its tongue-firmly-in-cheek humor catching all of the irony while still conveying a love of the industry. The art by Dan “the Body” Schkade, with colors by Marissa “Col. Von Slamstein” Louise, works in just about every way for this story. Without getting too tied down in detail, Schkade and “Von Slamstein” have captured the larger than life attitude and stature of the professional wrestler, as well as the slightly thicker across the middle physique of a star in decline. They’ve also set the stage for some good action as the forces of Wrestletopia move in to layeth the smacketh down on one Rock ‘n’ Roll Rory Landell. Invasion From Planet Wrestletopia is nothing but a good time, start to finish. I don’t think the goal here was to win awards (although those can be nice) or to shed light on a little seen corner of the human condition. As with professional wrestling itself, this one is all about the entertainment. In that regard, I’m gonna have to call this one a solid win.